Frank Nation ended up working at Jensen Motors in 1944, as an Inspector. Being on Reserved Occupation, it wasn’t Nation’s choice to go to Jensen Motors, he had to go where the authorities believed he was best needed. He remained at Jensen Motors from 1944 until the Company closed down in 1976. Using material from the family archive, the Museum has pieced together the life and times of Frank Nation. Born on 11th November 1911 in Oldbury, Worcestershire , and after basic education, Nation started work at Brockhouse & Co.Ltd in West Bromwich. Brockhouse manufactured all manner of castings, particularly for car manufactures. The firm was well known in the area, for paying their employees well. Nation married his childhood sweetheart, Florence [nee Hughes] on 16th September 1933. The couple had originally met as young children at Sunday School at the Wesleyan Church, Oldbury, and started to go out with each other in their teens. In fact Frank Nation’s sister, Bella, started going out with Florence’s brother John Hughes, and they would later marry. Frank Nation, and his girlfriend, Florence Hughes. 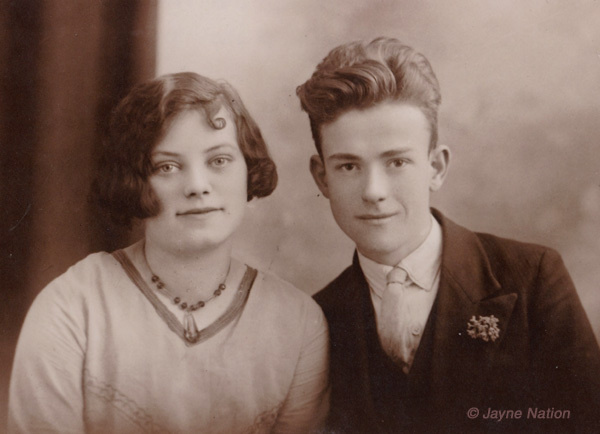 The couple would marry in 1933. 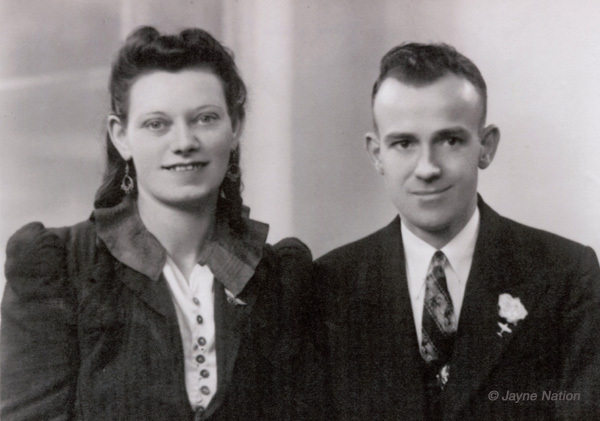 Frank and Florence Nation had two children , Maurice on the 5th September 1936, and Frank (junior) on 9th May 1939. The second child came along around the same time Nation was promoted to Inspector at Brockhouse. Undoubtedly a welcome increase in wages, with two children to look after. When war was declared in September 1939, Nation found himself on Reserved Occupation. 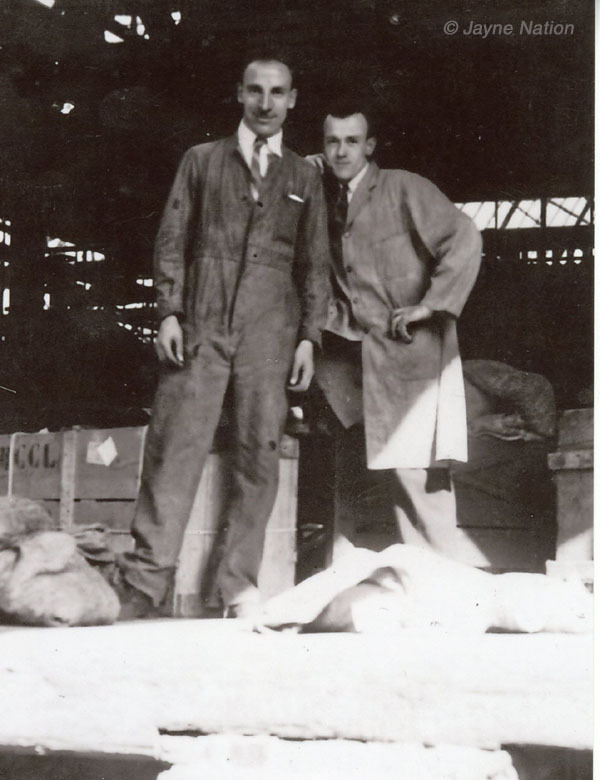 At some-point between 1939 and 1940, Nation had to leave Brockhouse to work in Stockport for Fairey Aviation. His time spent in Stockport isn’t well recorded by the family. In part, this may well have been due to the secretive nature of his war-work. Certainly, any documentation or passes from Fairey Aviation, would have been surrendered when he left that Company in 1944. Nation found digs at Shaw Heath, Stockport, and the Fairey Aviation factory was situated at Heaton Chapel, Stockport. As such, it was only a modest walk to the factory and back each day. The Fairey Aviation factory was at the forefront of aircraft production when war started. Between 1939 and 1945, the Company employed over 16,000 workers, the majority of which, were women. At the outbreak of war, the factory was producing the Fairey Battle, single-engined bomber, but very quickly took on production of the Bristol Beaufighter, and the Handley Page Halifax. 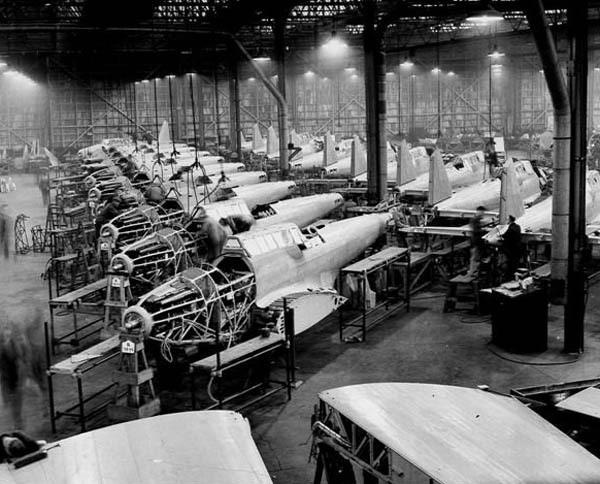 Production of the Fairey Battle at the Heaton Chapel factory. Photograph circa 1940. 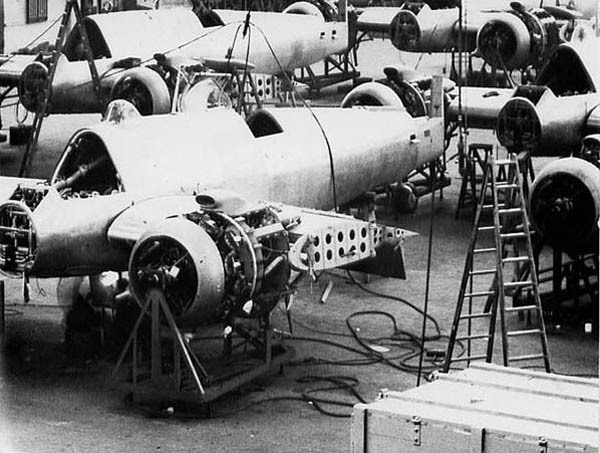 Bristol Beaufighters being built up at the Heaton Chapel factory during 1941. 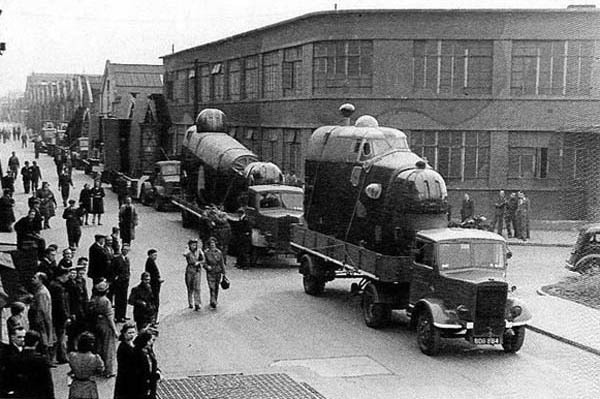 Sections of Handley Page Halifax bombers on lorries, about to leave the Heaton Chapel factory during 1941. Later in the war, they produced the Barracuda torpedo / dive bomber, and specialist munitions such as the Fireflash beam riding air-to-air missiles. The factory was heavily camouflaged, had anti-aircraft defences, along with armed guards. Frank Nation would have been well needed at the factory, undertaking inspection of materials. He would have undoubtedly have been just one of a number of inspectors working at Heaton Chapel. Frank Nation with his wife Florence on a home visit from Stockport. A proud Nation wears a small silver lapel aeroplane badge, indicating the type of war work he was involved with. 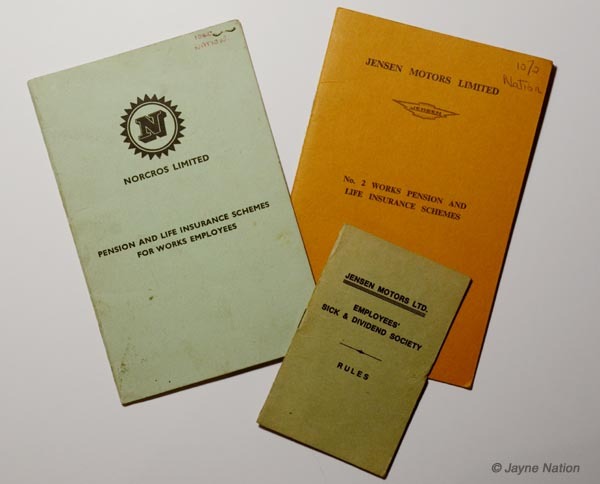 These could be purchased for a small donation at Fairey Aviation, the proceeds of which went to help the war effort. Photograph taken in the early 1940s. During 1944, one of Nation’s fellow workers, Margaret Gore, started to spread malicious gossip about Nation. The exact nature of this gossip isn’t known, but Gore may have been intimating that Nation was having an affair with one of the women workers. Letter sent from Margaret Gore to Nation on 4th July 1944. The morale of the workforce was always uppermost in times of war, and Nation’s bosses must have been concerned about the situation. The outcome was Nation being moved from Fairey Aviation, to Jensen Motors in West Bromwich, where he continued working as an Inspector. Jensen Motors were heavily involved in supplying material for the war effort. This included lightweight armoured cars, gun turrets and munitions. Nation’s enforced move to Jensen Motors would have coincided with their need for another Inspector. As W.W.II ended in May 1945, Nation wrote to his old employers, Brockhouse. He was asking if there was a vacancy for him as an Inspector. Even although the war was at an end, the free movement of employees to jobs of their wish, was sometime off. In a letter dated 18th May 1945, Nation was told by the personnel manager at Brockhouse, that it would not be possible to take him on. 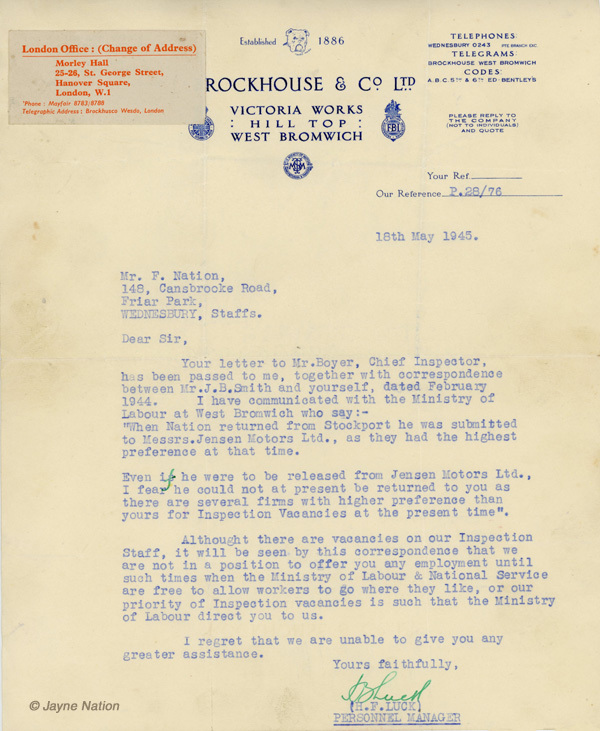 The letter sent to Nation from Brockhouse & Co Ltd on the 18th May 1945. Nation is advised that Brockhouse are not in a position to give him a job as an Inspector, due to the continued Reserved Occupation status being in place. Nation remained at Jensen Motors. His position as Inspector, was checking various materials as they came into the Company. Nation’s inspection would include chromed items, which he would scrutinise for imperfections, or glass, which had to be checked for any scratches or edge damage. Through Nation’s conscientiousness to his job, he was held in particularly high regard by his immediate bosses. Frank Nation (in brown coat) at Jensen’s Carter’s Green factory. It isn’t known who the young lad is, although probably an apprentice. The photograph dates from the late 1940s. 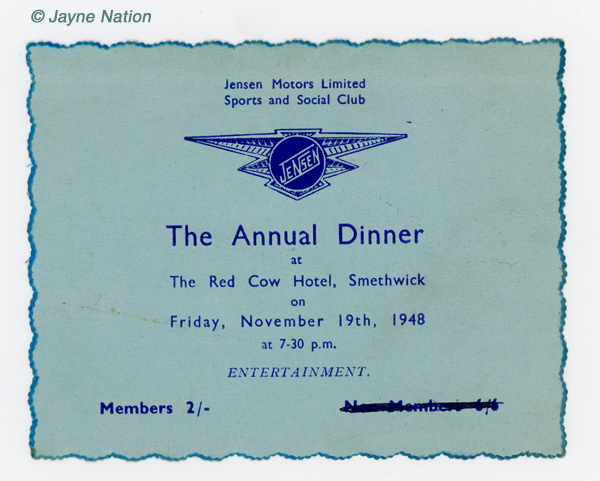 Nation’s admittance card for the annual dinner held in 1948 by the Jensen Motors Sports & Social Club. 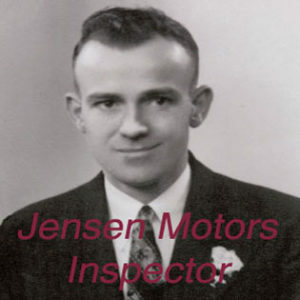 In addition to Nation’s work as Inspector at Jensen Motors, he was an active Trade Unionist. In April 1946, Nation became the Shop Steward for the Amalgamated Engineering Union, at Jensen Motors. How long he remained as the Shop Steward isn’t known. Three of Nation’s Union membership cards. The green card was his membership of the National Union Of Vehicle Builders from 1961. 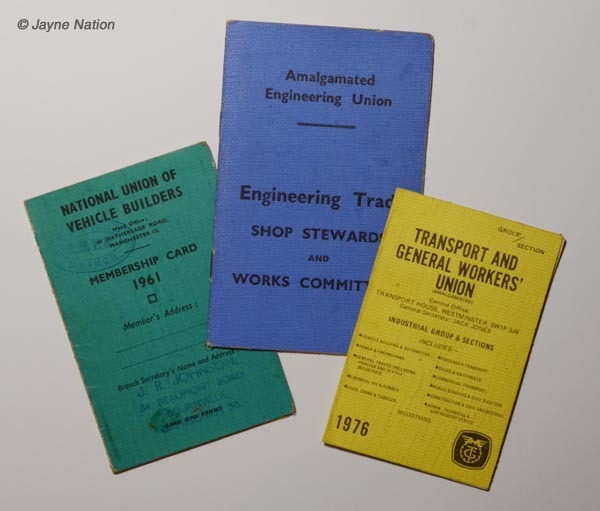 The blue card is for the Amalgamated Engineering Union dating from 1946, and the yellow card is for the Transport And General Workers’ Union from 1976. As well as working at Jensen Motors, Nation also worked some evenings for Darby’s Brewery as a barman in one of the local pubs (continuing barman work after the take-over of Darby’s Brewery by Mitchell’s & Butler). Later on, in the 1960s, Nation worked as head barman at the Star & Garter, on the high street of West Bromwich. 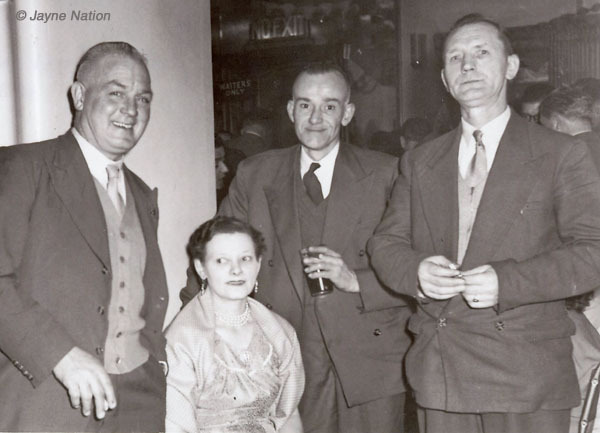 On his days off from Jensen Motors and pub work, Nation could often be found in the West Bromwich Working Men’s Social Club, where he had a bit of a reputation as a hard drinker. That said, with working at Jensen Motors during the day, and working behind a bar some evenings, any hard drinking had to be generally left over to Saturday night. Frank Nation with pint of beer. His wife Florence is sitting. The two other men remain unknown at this time. The photograph was taken in the late 1960s. Outside of drinking and betting, Nation had an allotment, and one of his pleasures was getting down to the allotment, where he grew a wide range of vegetables. As Jensen Motors slowly moved to their new factory at Kelvin Way from Carter’s Green, some employees left to find employment elsewhere, or retired. Everyone else eventually moved to Kelvin Way, and the Carter’s Green works was closed down. Nation moved to Kelvin Way. Any ideas of moving back to Brockhouse, had long gone. At Kelvin Way, Nation worked ‘on the deck’. This was the section at the front of Bay 1, where lorries would reverse to and drop off goods. Nation’s job involved helping to take the goods off the lorry, and then checking the goods for quality control. Anything sub-standard, or damaged was put to one side. These would then be listed, and returned. The lists were then deposited with the accounting department. Nation on the deck at Bay 1, wearing a brown coat. 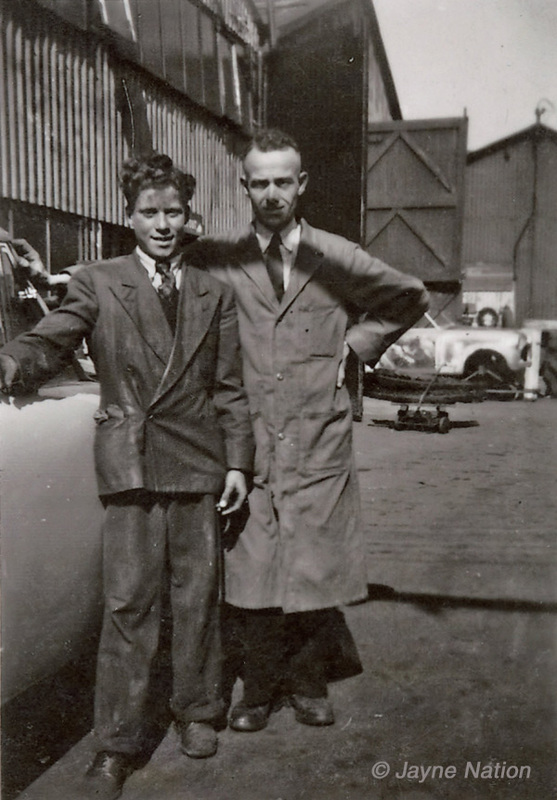 Clive Kendrick, a former assembly line worker at Jensen Motors, believes the man standing next to Nation in overalls, is Billy Osbourne, a fork lift truck driver. At the beginning of 1960, Nation’s son, Frank, was looking for work, and his father managed to get him a job as a labourer at Jensen Motors. Frank (jnr) only stayed at Jensen Motors for a couple of years, but by the time he left Frank (jnr) had been going out with a girl (Sandra Bath) from the trim shop. They became engaged in 1961, and married not long after. 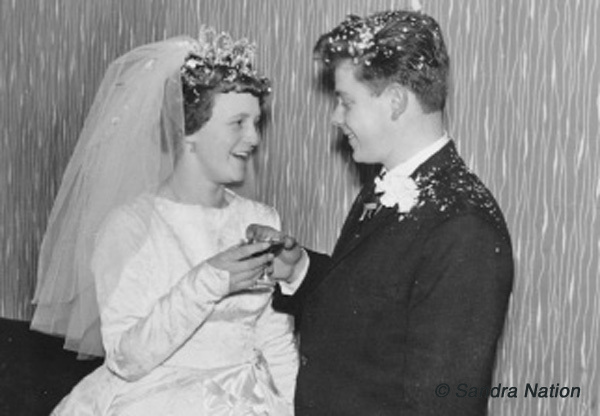 Sandra and Frank Nation (jnr) on their wedding day in 1962. It was a precarious period to be working at Jensen Motors in the early 1960s. There were a lot of lay-offs and redundancies. Bearing in mind, Frank Nation jnr hadn’t long joined Jensen Motors, it was going to be a case of last-in, first out, when redundancies occurred. Probably on the advise of his father, Frank jnr managed to get a job at Brockhouse, after leaving Jensen Motors. On the 25th March 1960, Nation was involved in an accident. Typically, he was on the deck ready for the next lorry. The next lorry that came in was from Jones Transport, Birmingham, this was to collect trimmed items for dispatch. Once everything had been put aboard the lorry, Nation noticed that a heavy case was resting on the cartons with trimmed items. He climbed aboard with the driver to move the case, and to check it hadn’t damaged anything. As the driver moved the case, it caught Nation, knocking him off the lorry, fracturing his wrist, and hurting his back. After sick leave, Nation was back at work, continuing in his role as Inspector. Three of Nation’s Pension and Life Insurance schemes with Jensen Motors. The light green Norcros booklet dates from 1964. The tan booklet is arranged by Brandt’s, and although undated, is probably around 1969. The small Employees’ Sick & Dividend Society Rules is undated but probably dates to late 1960s / early 1970s. Back in 1961, Nation’s wife, Florence, had been diagnosed with breast cancer. After surgery she was given the all clear, but later the cancer had returned. This led to her death on the 21st October 1970. Nation was devastated. Nation remained at Jensen Motors through to 1976. 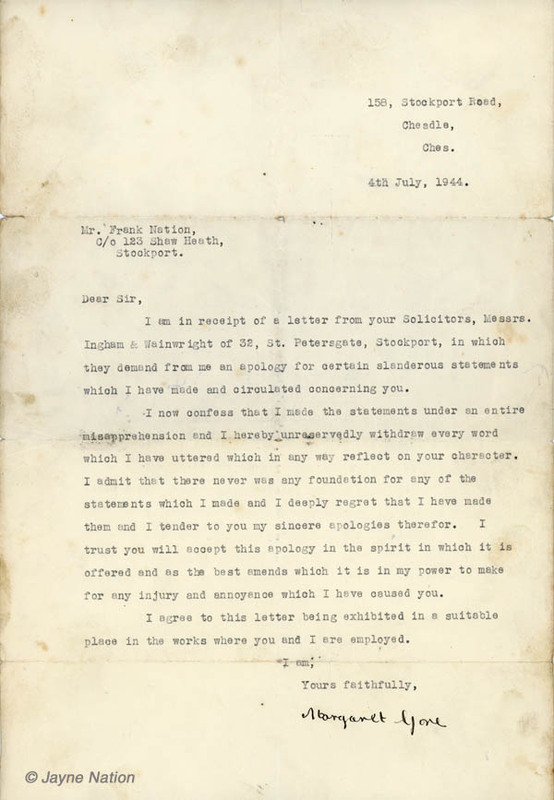 As with many of the employees still working at the factory at that time, Nation received his copy letter from Elston, the Personnel Manager. 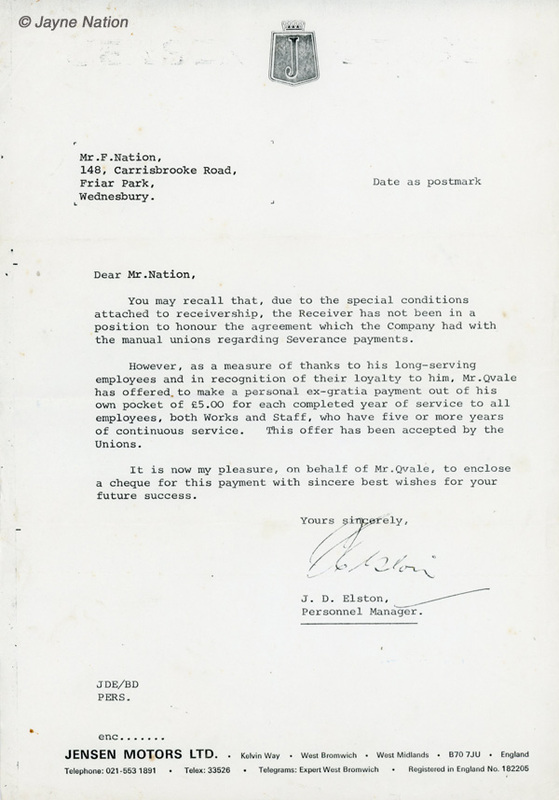 Letter sent in 1976 from the Personnel Manager, Elston, to Nation, outlining the position on severance pay. The letter explained that due to the conditions attached to receivership, that Jensen Motors could not honour its severance agreement it had with the unions. However, Mr Qvale has offered to make a personal ex-gratia payment to each employee of £5 for each completed year of service. This would give Nation £160. Frank Nation died on 10th September 1984 from a heart attack, aged 73.